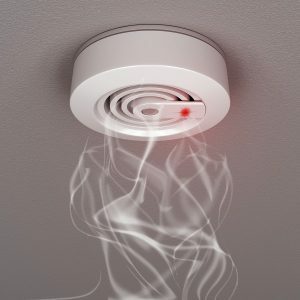 Use these 3 fire detectors to protect your business. There is no business out there that doesn’t need the best fire protection possible. In fact, there are four different kinds of fire detectors that can help protect your business. Heat and smoke are two of the main components of a fire emergency- which is why having the proper detecting systems in place can make all the difference. Here is what you need to know whenever a fire breaks out in your business. Ionization fire detectors are activated whenever they detect the presence of smoke in the vicinity. In fact, it’s these fire detectors, that feature two metal plates inside, that have an electrical current flowing back and forth as well. This means that when smoke reaches the chamber, it immediately cuts of the current, which then cues the alarm to sound. As a result, ionization-based detectors are typically best used in places where fires begin burning very rapidly like commercial kitchens. Photoelectric fire detectors are extremely similar to the ionization fire detectors. In fact, they are so similar that the single difference is that with photoelectric fire detectors, they rely on light instead of an electric current to work. As a result, smoke that enters the chamber in these detectors ends up disrupting the different beams of light which triggers the alarm to sound. One of the more common and better known fire detection system is a heat detector. Heat presents a problem as well because intense heat can really cause a fire to spread rapidly. In fact, heat can also quickly cause fire alarms to sound a lot more often than other fire detectors. So even though they are sensitive they can end up being extremely reliable in commercial buildings. This entry was posted on Thursday, December 6th, 2018 at 3:30 pm. Both comments and pings are currently closed.